Results: The epidermal growth factor (EGF) receptor is a protein receptor in cells that is implicated in 50 percent of breast cancers and in some head and neck cancers. Increased numbers of these receptors stimulate cells to grow rapidly and out of control. Drugs that target the EGF receptor, and the signaling molecules that bind to it, have become a favorite target for cancer drugs. Recent research at Pacific Northwest National Laboratory shows that there are many different ways to activate the EGF receptor, even in normal cells. And a brand-new mechanism has been uncovered for the hormone insulin growth factor 1, or IGF-1, that can amplify the effect of normal amounts of EGF receptor. This newly discovered route for promoting cell growth could provide researchers another way to combat malignancy. The researchers reported their results in the Journal of Biological Chemistry. They are one of the first groups to examine the multiple biochemical pathways used by the EGF receptor at the same time in healthy breast tissue cells, and the first to identify the novel way that IGF-1 works with EGF receptors to stimulate cell growth. Why it matters: Human cells reside in a rich mixture of small molecules, each conveying a particular type of information. All cells must integrate information from all of these various molecules to make the decision to proliferate, die or remain quiescent. Failure of a cell to appropriately interpret and respond to chemical cues in its environment contributes to many aspects of cancer. When stimulated by its namesake, the EGF receptor impels the cell to multiply by turning on a variety of genes. Many diagnosed breast cancers have too many EGF receptor or related proteins on their cell surfaces, encouraging unregulated growth. Drugs that inhibit this receptor slow cancer growth, making the EGF receptor a popular target for cancer researchers. 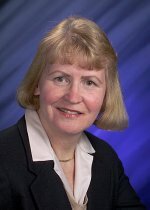 "But all treated cells eventually develop resistance," said Dr. Karin Rodland, Laboratory Fellow at PNNL and lead author of the manuscript. Luckily, cell growth is a complicated process. Epidermal growth factor is not the only protein that can turn on the EGF receptor cell growth program. "There are many different types of receptors that funnel their input through the EGFR axis," Rodland said. "We want to understand how they do that." Methods: The scientists stimulated healthy breast tissue with various signaling molecules and simultaneously prevented "shed" proteins from being able to stimulate the EGF receptor growth program. They determined how well this worked by measuring how active a certain growth-promoting gene called ERK (extracellular signal-regulated kinase) became. In almost all cases, the signaling proteins could not get ERK going without being able to tap into the EGF receptor axis—the pathway that starts at the EGFR and ends at ERK. But on the outside looking in was IGF-1. All the other signaling molecules tested worked by shedding more proteins that then bind to and activate the EGFR receptor. So the researchers expected IGF-1 to work the same way—but it didn't. Additional experiments suggested that IGF-1 turns on not ERK, but ERK's controller inside the cell, known as Ras. The scientists speculated there are two possible ways IGF-1 does this. One possible pathway is that IGF-1 binds to its own receptor, building a bridge between the amphiregulin-stimulated EGF receptor and Ras, which switches Ras on. Alternately, Ras could be sitting in the cell, held in check by some sort of molecular brake. IGF-1 might release that brake, making the cell more response to the same dose of amphiregulin. Understanding how IGF-1 does this is key to designing drugs against it that could be used in cancer treatment. What's next: It's possible that other hormones similar to IGF-1 could use a similar priming mechanism. 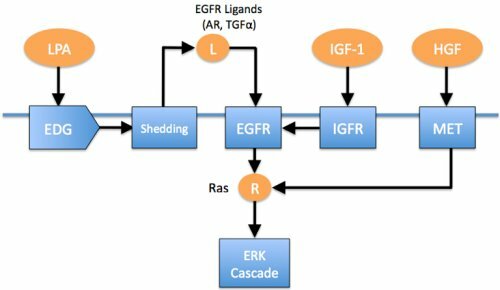 Growth factors in the same class as IGF-1 known as receptor-tyrosine kinases might also stimulate the EGFR without invoking shedding. Experiments are under way. 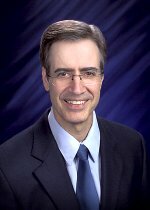 Acknowledgments: The research team includes Rodland, Steven Wiley and Rick Zangar, PNNL; and former PNNL scientists Nikki Bollinger, Danielle Ippolito and Lee Opresko. The work was supported by PNNL's Biomolecular Systems Initiative and the National Cancer Institute. Epidermal growth factor (EGF) is a small protein that is a powerful mitogen—meaning that it stimulates cells to enter mitosis, or cell division. EGF promotes cell growth and is essential in embryo development and wound healing. It is produced by many normal cell types, and variants of EGF are made in large amounts by some tumors. Epidermal growth factor receptor (EGFR) is a protein found on the surface of cells to which EGF binds. When EGF attaches to EGFR, it activates the enzyme tyrosine kinase, triggering reactions that cause cells to grow and multiply. EGFR is found at abnormally high levels on the surface of many types of cancer cells, which may grow excessively in the presence of EGF. Despite the importance of EGFR transactivation in disease processes, very little is known about its role in normal cell physiology. The complexity of the EGFR system is a significant barrier to this understanding, because it obscures the mechanisms by which a transactivating factor might act.